While your pipeline process has medium operating pressure and temperature need, ductile iron can be a cost effective approach, specially designed to thoroughly filter the impurities from the liquid flow stream. This ductile iron Y strainer is designed and manufactured following ISO 9001:2015 quality standards and hence the quality of ductile iron Y strainer is internationally accepted. Other than, the material used in the construction of this Y strainer is of the highest grade and therefore promises to outlast years without failing. Further, the entire inventory of the ductile iron is tested by our quality analyst team against API standards to ensure leak free performance of the same. The precision engineering ensures the impeccable filtration of any type of sediments from the pipe, where in the screen is made from the 304 stainless steel material. The different size of perforation is available in the screen that is available upon customer request. We as a manufacturer of the ductile iron Y strainer are pleased to introduce the range in the widest assortment of maximum operating pressure capacity and temperature withstand capacities, which are sequentially 100 psi to 500 psi and 120° F to 480° F. Different types of end are available, to match screwed ends, but weld or socket weld end. 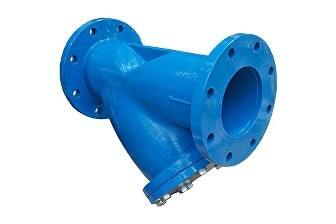 This ductile iron Y strainer is available in India as well as overseas countries at the most competitive rates.